There aren’t many places on this planet where travellers are so well catered for – in terms of both man-made enticements and splendours of the natural realm. New Zealand is bigger than the UK, with one-fourteenth the population size. Filling in the gaps are sublime forests, majestic mountains, and the stunning lakes, beaches and fiords that have made this country one of the best hiking (locals call it ‘tramping’) destinations on Earth. It’s renowned worldwide for having a relaxed, friendly, spacious and outdoor adventure lifestyle (think sport, walks, BBQs, and beaches). 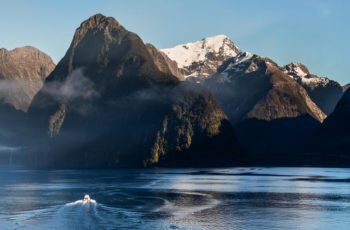 When you combine this adventurous outlook with a stunning backdrop you start to see why travellers rate New Zealand as the action/adventure/adrenalin capital of the world! New Zealand's electricity supply runs at 230/240 volts, and we use angled two or three pin plugs (the same as Australia). Most hotels and motels provide 110 volt ac sockets (rated at 20 watts) for electricrazors only. New Zealand's unit of currency is the dollar (NZ$). All major credit cards can be used in New Zealand, with Visa and MasterCard accepted most widely, followed by American Express and Diners Club. All goods and services are subject to a 15 percent Goods and Services Tax (GST) included in the displayed price. Visitors cannot claim this tax back, however when a supplier ships a major purchase to a visitor's home address the GST will not be charged. Due to the discontinuation of 1c, 2c and 5c pieces, purchases made in New Zealand are subject to "rounding" of amounts either up or down. The Reserve Bank believes most retailers are adopting the Swedish Rounding System. Under this system prices, ending in 1 to 4 cents will be rounded down and prices ending in 6 to 9 cents will be rounded up. For example, a purchase of $15.14 would be rounded down to $15.10, and a purchase of $15.16 would be rounded up to $15.20. It is at the retailer’s discretion how they handle prices ending in 5 cents. New Zealand banks are open from 9.30am to 4.30pm Monday to Friday. Some are also during weekends. . Automated Teller Machines (ATM) are widely available at banks, along main shopping streets and in malls. International credit cards and ATM cards will work as long as they have a four-digit PIN encoded. Check with your bank before leaving home. tap water in New Zealand is universally safe to drink and standards exist to ensure that major contaminating organisms such as Protozoa and Cryptosporidium are removed or reduced to safe levels. The cuisine in New Zealand is very seasonal and relies heavily on local produce. As the islands are very agricultural there is a wide variety of fresh foods always available. The influences are largely British although there are Asian influences creeping in and takeaways are becoming more popular. New Zealand is an island nation with its waters containing a large variety of fish and seafood. Despite this, until recently shellfish hasn't played an important part in the diet of New Zealanders. The consumption of fish has traditionally been low as meat has been the main preference for meals. Having said this, fish and seafood has always been significant in the Maori diet and you will notice that the names of many of them are still used today in Maori. From the crisp days of spring to the burnt orange beauty of autumn, New Zealand is a traveler’s paradise. New Zealand's climate is mild, and ranges from subtropical in the north to temperate in the south. No matter the season, the majority of their main attractions are open year-round. During spring, New Zealand bursts with new life. Colorful blooms, baby wildlife and ‘waterfall season’ makes this an inspiring time of year to visit. Temperatures range from 40°F to 65°F. 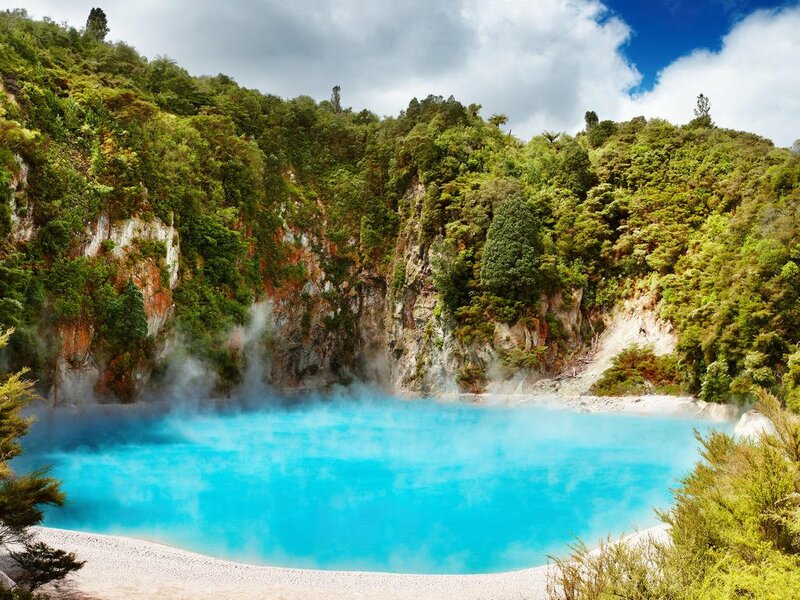 New Zealand’s many beaches and lakes are perfect to cool off during the summer months. Summer activities tend to make the most of the sun, sea and sand. Temperatures range from 70°F to 90°F. In autumn, New Zealand enjoys some of the most settled weather of the whole year. Soak up long, sunny days and golden leaves with hiking, cycling or kayaking. Temperatures range from 45°F to 70°F. The winter months brings snow blanketing soaring mountains in certain parts of the country and clear, crisp days that awaken the senses. Hit the ski slopes, visit a winery or two or head along to one of the many winter festivals. Temperatures range from 35°F to 60°F. 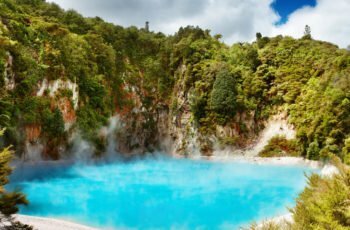 With so many things to do and spectacular places to see, choosing how you travel around New Zealand is as important as choosing where you want to go. Your choice of transport will depend on how quickly you want to get from A to B. Plane, train, bus, boat, car or caravan – you could even cycle if you’re feeling adventurous. In most cases getting there is all part of the fun so hire a motor home to see the sights at your own pace, or jump on a train for a scenic tour through remote areas often inaccessible by road. New Zealand is typically an informal place so pack casually for comfort. Famous for having four seasons in one day; our advice if you are traveling even in the summer is to pack a light jacket or pashmina shawl just in case the weather turns cooler or if you're visiting higher altitudes. You can also expect some rain, so include a light raincoat. Smart casual clothes are acceptable at most restaurants and night-spots. If you plan to do much walking then lightweight walking shoes or sneakers are fine. New Zealand is generally a very safe place to travel with a relatively low crime rate, few endemic diseases and a great healthcare system. Visitors are still advised to take the same care with your personal safety and your possessions as you would in any other country, or at home. Take copies of your important documents (like your passport and credit cards), and keep them separate from the originals. You should also keep a record of the description and serial number of valuable items (like cameras, tablets and smart phones). And remember, in an emergency dial 111. 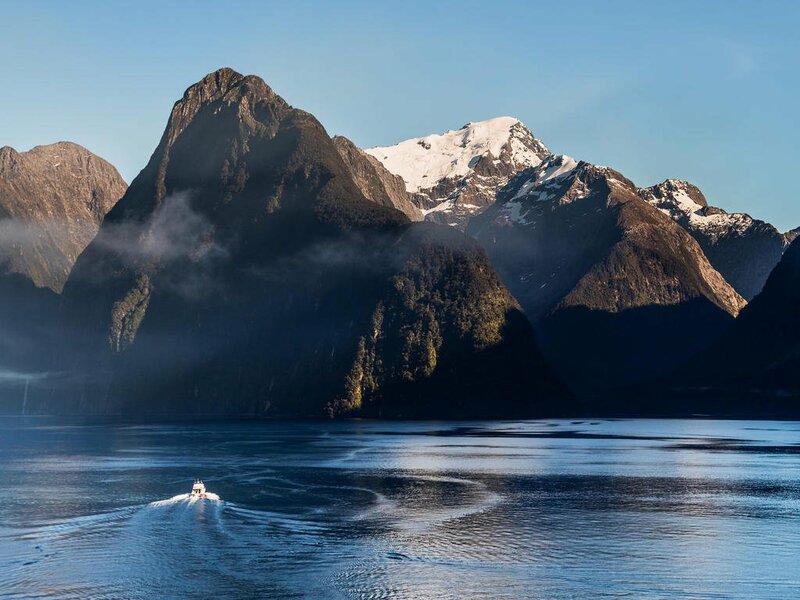 New Zealand’s extensive coastline and network of waterways provide ample opportunity for swimming, boating and fishing. However, many people are unprepared for the potential dangers of the water. We recommend that you visit Water Safety or AdventureSmart for advice on how to stay safe on New Zealand's beaches and waterways. • If in doubt, stay out. • Never swim or surf alone, or when cold or tired. • Swim between the flags. Beaches with potential hazards are often patrolled by lifeguards, who put up yellow and red flags. Between these flags is the safest place to swim. Listen to advice from life guards. • If you have children with you, watch over them at all times. • Learn to recognize ocean rip currents. U.S. citizens do not require a visa for stays up to three months. Non U.S. citizens should consult with your local embassy. Dial 111 for all emergencies. The dates of certain public holidays change from year to year – refer below. If a public holiday falls on a Saturday or Sunday, then the Monday is also declared a public holiday. It suffices to say that getting to know New Zealand’s relaxed and friendly people will be one of the things you love most about your visit. Strike up conversations along your journey – a casual chat at a bar or restaurant or at a local market – it’s the best way to get insider knowledge on the area you’re visiting and you may even pick up the local Kiwi lingo and make new life-long friends! VAT of 10% is levied on all goods and services. When leaving Botswana, non-residents may claim a VAT refund on goods exported as accompanied luggage. The value of the goods must exceed P 5,000 per export and goods must be available for inspection. Refunds are made by way of a check payment which is mailed. In order to claim, the original tax invoice with passport details reflected thereon, must be presented to the designated Customs Officer together with the VAT 006.1 claim form and the BW500 export declaration form. New Zealand has two time zones. The main islands use New Zealand Standard Time (NZST), 12 hours in advance of Coordinated Universal Time (UTC) / military M (Mike), while the outlying Chatham Islands use Chatham Standard Time (CHAST), 12 hours 45 minutes in advance of UTC / military M^ (Mike-Three). During summer (last Sunday in September until the first Sunday in April) daylight saving time is observed and clocks are advanced one hour. New Zealand Daylight Time (NZDT) is 13 hours ahead of UTC, and Chatham Daylight Time (CHADT) 13 hours 45 minutes ahead. While tipping is customary for certain services in America, it isn’t common in other places around the world – like New Zealand. In the States, waiters and waitresses often make less then minimum wage and rely heavily on tips to make a living, but in other countries, workers are paid a better wage and so tips are often not expected or necessary. However, in certain situations and in touristy areas in New Zealand, tipping is more common for exceptional service. So when do you tip and how much? Restaurant workers do not work only for tips in New Zealand, so do not feel obliged to leave a tip when paying your check. If the service was excellent, leaving a 10% gratuity is more than generous and your waiter or waitress will certainly appreciate it. Tipping taxi drivers in New Zealand is not a common practice. If you attempt to tip your driver, it may even be refused. It is common to leave your change for the driver, if for no other reason than making the paying process easier. If you insist on tipping the driver, 10% or less is reasonable, but do not be surprised if they refuse to accept your tip. Tipping is customary at hotels in New Zealand, so tipping $1-$2 per bag carried and $1-$5 for room/maid service is viewed as a nice gesture. If the concierge does you a favor or provides you with excellent service, tipping $10-$15 is more than acceptable. Tipping tour guides in New Zealand is common as their services are aimed at tourists. While gratuities are not necessary, if you feel your tour guide did an exceptional job, tipping a few dollars will likely not be refused. Don’t feel pressured to leave a tip when at a spa in New Zealand, but feel free to tip if you feel you received outstanding service. Leaving 5-10% is considered generous. Knowing when and how much to tip when traveling in New Zealand can be confusing, so if you are unsure, ask a receptionist or concierge. They will likely clear up any concerns you may have. Tipping is not expected in New Zealand, as it is in the United States, rather it is viewed more as a bonus. So when travelling in New Zealand, do not feel obligated to tip but feel free to do so if you believe you have received outstanding service.